ST. PETERSBURG, Russia (AP) — It’s good the French make lots of Champagne, because with the trophy-winning potential of its team that will play in the World Cup final on Sunday, they could be bathing in the stuff for years to come. Like Spain’s team that won everything — two European Championships and one World Cup — in an awesome spell of dominance from 2008 to 2012, the youthful, skillful Bleus could have the makings of a dynasty. Heaps of talent, not just on the pitch but on the bench and back in France, too. A defense that defanged the World Cup’s most prolific scoring team, Belgium, in a semifinal so engrossing that 90 minutes seemed to zip past in half that time. Youth, so much youth, running through key positions in the team like an electric current. The average age of France’s starting line-up in the 1-0 victory over Belgium was a shade under 26. Good for many years to come. And — really he should go at the top of this list — Kylian Mbappe, a.k.a football dynamite and surely the strongest candidate for the World Cup’s best player award. Imagine how much better, how much more polished France’s young diamond will be at age 21, at the 2020 European Championship, or at age 23, at the 2022 World Cup in Qatar, and on and on. The mind boggles at the potential of the 19-year-old who may be the best deal Paris Saint-Germain ever make, bought one year ago for 180 million euros ($210 million) and perhaps worth now double that after four fantastic weeks in Russia. France’s timing is good, too. Coach Didier Deschamps is getting his pieces to fit just as other football powers in Europe are unraveling. Portugal, the reigning European champion, will soon have to find a way to win without Cristiano Ronaldo, who although still remarkably potent at age 33, can’t carry his country forever. Germany is in disarray, searching for scapegoats and answers, after the 2014 World Cup champion exited lamely from the group stage this time. And Spain has flogged its tiki-taka game of possession and passing to death and needs to find a new path to victory and without midfielder Andres Iniesta, who retired after Spain’s loss to Russia in the first knockout round. Spain’s new coach Luis Enrique has his work cut out. In short, there’s a vacuum to fill and France is poised to do it. Unless the English get there first. Like Deschamps, England coach Gareth Southgate has built his team around young players. If England beats Croatia in the second semifinal on Wednesday, then the final could see the two youngest teams in the knockout round fighting not just for this trophy but for the momentum that could then help them win more. For months, Deschamps has been downplaying expectations by making out that France’s youth was a drawback, not its strength. True, the France team that won the World Cup in 1998 with Deschamps as its captain was considerably older. But the strength of this team is that its young players already have wise heads that belie their tender years. Just 25, Raphael Varane is a rock in the French defense, with a young man’s speed but the big-game maturity from having won multiple trophies with Real Madrid. With his partner at the back, Samuel Umtiti, still just 24, France has a central defensive pairing that should frustrate attackers long into the future. Umtiti’s winner against Belgium was only his third goal for France. But its quality — he out-jumped the taller Marouane Fellaini to head in a corner — suggested there could be more where that came from. Paul Pogba, at 25, is curbing his natural exuberance, his playground-football instincts and putting in more sober, stable performance in the midfield. On the flanks, left-back Lucas Hernandez and right-back Benjamin Pavard, both aged 22, continue to impress. Pavard struggled at times against the speed of Belgium’s Eden Hazard and played with more restraint than in previous games, missing several opportunities to get the ball to Mbappe when he was making runs. But Pavard and Hernandez have shown they are very quick studies. The victory against Belgium was, for each of them, only the 11th time they have played for France. Remarkable that their 12th game will be a World Cup final. Digging up these two treasures was one of Deschamps’ smartest moves. The big questions for France ahead of Sunday revolve around its central strike partnership of Antoine Griezmann and Olivier Giroud. Both squandered chances against Belgium. Griezmann, at 27, still has a future with France. But Giroud, at 31, is increasingly looking like the odd man out, the ponderous weak link when France is surging forward at speed, unable to keep up with Mbappe’s inventiveness and his Usain Bolt-like runs. 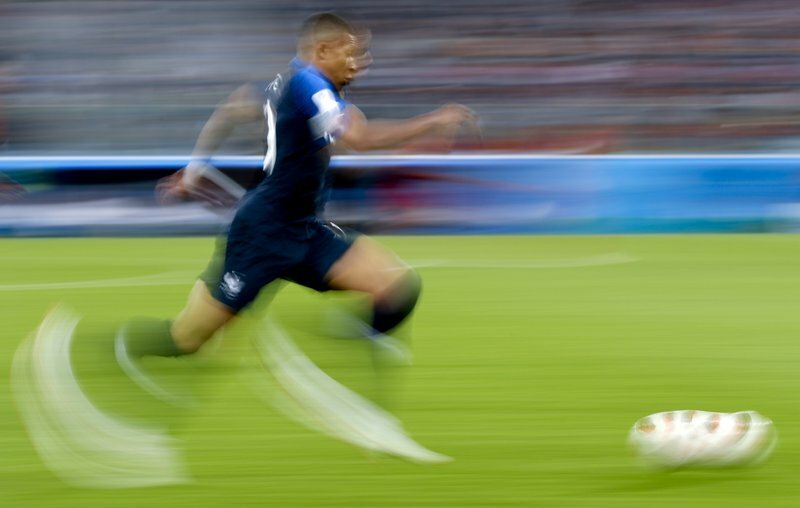 After Russia, one answer may be to move Mbappe to the center of the France attack and put Giroud out to pasture. But how and where to best use Mbappe is a good problem to have. First things first: Win Sunday, turn all this youthful promise into a trophy, so others can follow.